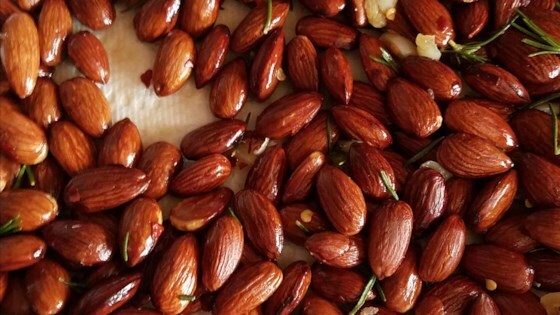 "I get so many compliments on these almonds, and they're fun and simple to make. I leave most of the garlic and rosemary leaves in with the almonds. They add color and taste delicious, too. Salt the almonds to taste. Store in a resealable bag or airtight container. Delicious paired with cheeses or all on their own. I always leave a small dish of them out for snacking and find myself having to refill it often." Spread almonds on a baking sheet. Bake in the preheated oven until almonds are golden brown and fragrant, 15 to 20 minutes. The nuts will continue to cook after removing from oven. Transfer hot almonds to a wide-bottomed glass or stainless steel bowl. Heat olive oil, garlic, rosemary leaves, red pepper flakes, and sea salt in a saucepan over low heat, just before almonds are out of the oven. Mash the garlic and rosemary in the hot oil to release flavor. Pour hot oil mixture over almonds; stir almonds every 5 to 10 minutes until completely cooled. Drain oil from the almonds; transfer almonds to a paper towel-lined plate. The almonds will still be shiny and oily to the touch. These are excellent. I sprinkled pyramid sea salt on top and served them warm. Thanks for a great recipe! WAY too greasy for me. It really wasn't anything special.